The settlement of South Dakota is also Lois (Sutton) Byrum’s history. Lois’ grandparents came to western Sully County, along the Missouri River, in the mid-1890s. Lois’ father was a rancher, and she grew up in that area. She attended country school through the eighth grade. Her family moved to Onida when she started high school. After graduating from Onida High School, Lois went to the University of South Dakota for two years. She then attended and graduated from the University of Colorado with a bachelor’s degree in nursing. By this time, Lois had married a man who had caught her eye while she was in high school. Elliott Byrum was in the class two years ahead of Lois. Elliott was serving in the Air Force. The Byrums had a car and implement dealership in Onida, and Elliott helped his father farm. “I worked part-time at the hospital in Onida. Much of the time I was the only RN in Onida,” Lois said. The Byrums raised four children: two girls and two boys. Daughters Kathy Asmussen and Karla Byrum both live in Sioux Falls. Son Curt lives in Scottsdale, Ariz., and son Tom lives in San Antonio, Texas. Lois has nine grandchildren and eight great-grandchildren. “I’ve always enjoyed golf. I spent a lot of recreational time playing golf,” Lois said. Lois must have passed her talent and enjoyment of golfing onto her sons, as Curt and Tom have both been professional golfers since the 1980s. 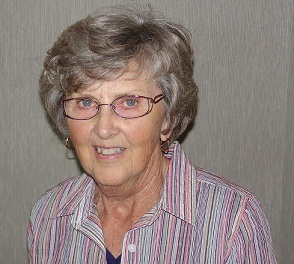 Lois also enjoys reading, crossword puzzles and volunteering at the Cultural Heritage Center. She volunteers Wednesday afternoons at the front desk.